30-year fixed-rate mortgage (FRM) averaged 4.40 percent with an average 0.5 point for the week ending April 5, 2018, down from last week when it averaged 4.44 percent. A year ago at this time, the 30-year FRM averaged 4.10 percent. 15-year FRM this week averaged 3.87 percent with an average 0.4 point, down from last week when it averaged 3.90 percent. A year ago at this time, the 15-year FRM averaged 3.36 percent. 5-year Treasury-indexed hybrid adjustable-rate mortgage (ARM) averaged 3.62 percent this week with an average 0.4 point, down from last week when it averaged 3.66. A year ago at this time, the 5-year ARM averaged 3.19 percent. “After dropping earlier this week on trade-related anxiety in financial markets, the benchmark 10-year Treasury stabilized on Wednesday, but at a level slightly lower than from the start of last week. 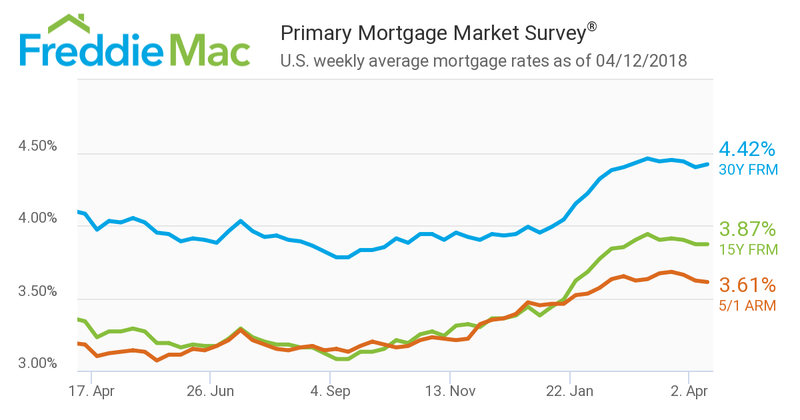 Mortgage rates followed and fell for the second consecutive week; the U.S. weekly average 30-year fixed mortgage was 4.4 percent in our survey this week. 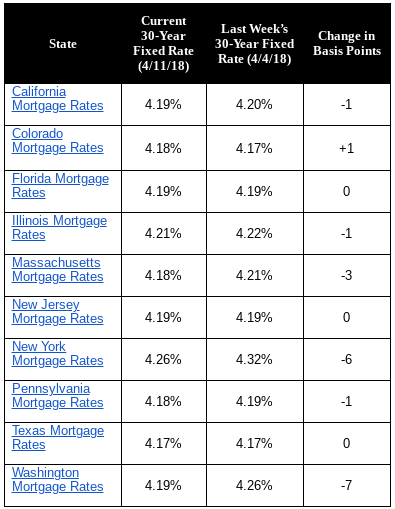 “Though rates on the 30-year fixed mortgage are up 0.3 percentage points from the same week a year ago, a robust labor marking is helping home purchase demand weather modestly higher rates. The 30-year fixed mortgage rate on Zillow Mortgages is currently 4.19 percent, down two basis points from this time last week. The 30-year fixed mortgage rate stayed hovered around 4.22 percent for most of the week before falling to the current rate today. The rate for a 15-year fixed home loan is currently 3.61 percent, and the rate for a 5-1 adjustable-rate mortgage (ARM) is 3.62 percent. 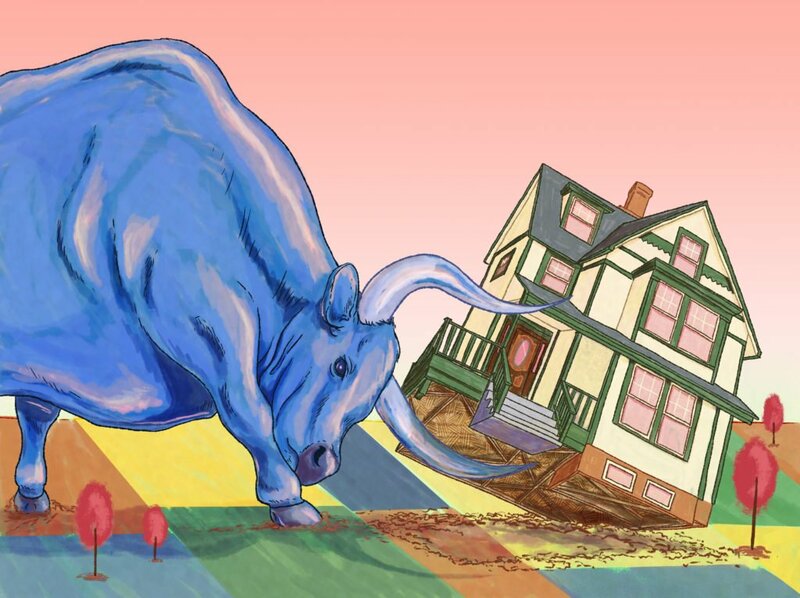 The rate for a jumbo 30-year fixed loan is 4.31 percent. 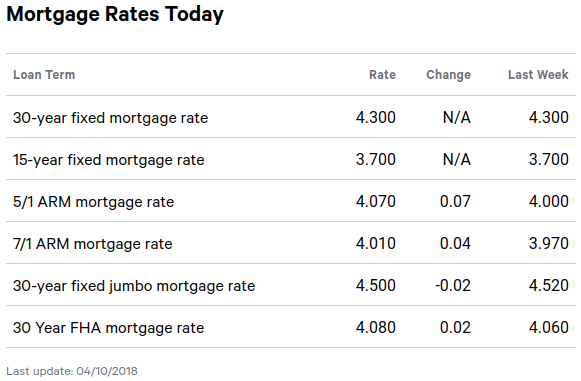 “Mortgage rates were flat over the past seven days despite escalating trade tensions between the United States and China, a mixed March employment report, and comments from several FOMC members hinting at a slower path of interest rate hikes,” said Aaron Terrazas, senior economist at Zillow. “Given the scale of geopolitical risk and equity market volatility, it is surprising that mortgage rates were so steady, and suggests that long-term lending markets are – at least for the moment – writing off the headlines as transitory. “Markets are keeping an eye on inflation and federal spending data this week, as well as several speeches by key FOMC officials early next week. Beyond the standard economic calendar, rates could rise if trade tensions escalate or if military action in the Middle East looks likely. Mortgage applications for new home purchases decreased 2.6 percent compared to March 2017. Compared to February 2018, applications increased by 14 percent. This change does not include any adjustment for typical seasonal patterns. By product type, conventional loans composed 71.2 percent of loan applications, FHA loans composed 15.4 percent, RHS/USDA loans composed 1.4 percent and VA loans composed 11.9 percent. The average loan size of new homes decreased from $338,078 in February to $337,597 in March. The MBA estimates new single-family home sales were running at a seasonally adjusted annual rate of 682,000 units in March 2018, based on data from the BAS. The new home sales estimate is derived using mortgage application information from the BAS, as well as assumptions regarding market coverage and other factors. The seasonally adjusted estimate for March is an increase of 7.9 percent from the February pace of 632,000 units. On an unadjusted basis, the MBA estimates that there were 65,000 new home sales in March 2018, an increase of 18.2 percent from 55,000 new home sales in February. “Applications taken for new home purchases decreased year over year in March,” said Joel Kan, associate vice president of economic and industry forecasting. “We saw a strong January and February, and that may have pulled some activity forward. We did, however, see the third straight month over month increase, which is in line with the typical seasonal pattern at this time of the year. The Market Composite Index, a measure of mortgage loan application volume, decreased 1.9 percent on a seasonally adjusted basis from one week earlier. On an unadjusted basis, the Index decreased 1 percent compared with the previous week. The Refinance Index decreased 2 percent from the previous week. The seasonally adjusted Purchase Index decreased 2 percent from one week earlier. The unadjusted Purchase Index decreased 1 percent compared with the previous week and was 0.5 percent lower than the same week one year ago. The refinance share of mortgage activity decreased to its lowest level since September 2008, 38.4 percent of total applications, from 38.5 percent the previous week. The adjustable-rate mortgage (ARM) share of activity decreased to 6.3 percent of total applications. The FHA share of total applications increased to 11.0 percent from 10.1 percent the week prior. The VA share of total applications increased to 10.9 percent from 10.3 percent the week prior. The USDA share of total applications remained unchanged at 0.8 percent from the week prior. The average contract interest rate for 30-year fixed-rate mortgages with conforming loan balances ($453,100 or less) decreased to 4.66 percent from 4.69 percent, with points increasing to 0.46 from 0.43 (including the origination fee) for 80 percent loan-to-value ratio (LTV) loans. The effective rate decreased from last week. The average contract interest rate for 30-year fixed-rate mortgages with jumbo loan balances (greater than $453,100) decreased to 4.53 percent from 4.56 percent, with points increasing to 0.31 from 0.27 (including the origination fee) for 80 percent LTV loans. The effective rate decreased from last week. The average contract interest rate for 30-year fixed-rate mortgages backed by the FHA decreased to 4.66 percent from 4.74 percent, with points increasing to 0.76 from 0.54 (including the origination fee) for 80 percent LTV loans. The effective rate decreased from last week. The average contract interest rate for 15-year fixed-rate mortgages decreased to 4.08 percent from 4.09 percent, with points increasing to 0.50 from 0.42 (including the origination fee) for 80 percent LTV loans. The effective rate increased from last week. The average contract interest rate for 5/1 ARMs increased to its highest level since February 2011, 3.93 percent, from 3.87 percent, with points increasing to 0.60 from 0.28 (including the origination fee) for 80 percent LTV loans. The effective rate increased from last week. The 30-year fixed mortgage rate is 4.30. The average rate you’ll pay for a 30-year fixed mortgage is 4.29 percent, an increase of 2 basis points from a week ago. A month ago, the average rate on a 30-year fixed mortgage was higher, at 4.34 percent. The average 15-year fixed-mortgage rate is 3.68 percent, down 1 basis point from a week ago.